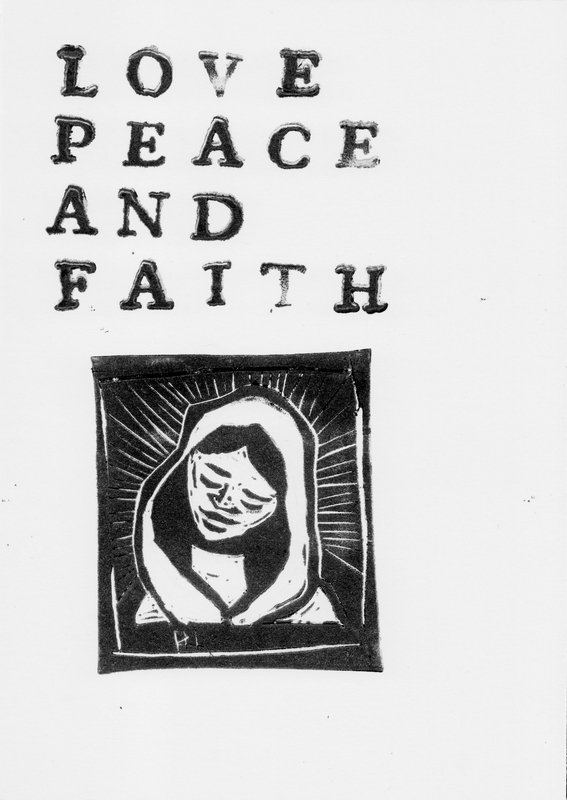 The Virgin Mary rendered in simple Linoprint accompanies the phrase: “Love, Peace and Faith,” in this relief printmaking piece measuring 5×7. Printed on Rives light printmaking paper. Hand carved and printed with exquisite care, the Virgin Mary is depicted in her simple “Handmaiden of the Lord” persona. From this humble beginning, she became the Queen of Heaven and the Mother of God. Printed with hand set type bearing the motto: “Love, Peace and Faith,” this jewel of a piece will inspire you to do your best and know that it is enough.